Everyone wake up and had their breakfast while Kunj still sleeping he had half day off that’s why.Till he didn’t wake up she finished her all kitchen work.Twinkle making cheese omelette for Kunj just than there Anjali come and see her. Anjali: what are you doing? Twinkle: nothing much just making breakfast for Kunj you know he is angry with me what about yours?
. Both laughs out. Acha you do this after we have to see things for Avni okay. Everyone sitting it’s late today they were having their breakfast while yuvi just thinking about Avni and himself playing with food which seen by everyone they all giggles just than Surjit. Surjit:Anita today we have lots of work. Anita:haa ji I’ll shop so much for my Daughter in law.Yuvi look at them and give them look. Maya:for your alliance papa get fixed with Sanaya.Yuvi didn’t said anything just bow down his head maya winked everyone so they didn’t tell him. Twinkle take Kunj breakfast in tray and went for their room. She entered in room and slightly shut door and keep the breakfast on table. Twinkle:my sleeping king sleeping still uff. She went near bed and sit beside Kunj admire Kunj who sleeping peacefully she caress his hairs and kissed on his forehead.Kunjj wake up na. Moving her finger on his face due to this Kunj sleep get disturb. Kunj: Kya hai let me sleep. twinkle:no you sleep enough now wake up I have to go Maa house.. Kunj open his eyes fully. Kunj:kyu.. haan ja you are good there only Twinkle chucked and pulled blanket. Twinkle:whatever now wake up fast.. still you angry with me haa we just kidding Kunj huhu see na Anjali Rahul itself talk to her and look at my husband meri toh Kismat hi oh my mata. Make puppy face Kunj look at her..
Kunj:acha siyappa queen.He get up and sit there only. Good morning. Twinkle:haa good morning now get freshen up fast. Kunj make pouty face and look at twinkle gloomily. Haa I know first brush than. .. kissed on her neck slightly. I’ll not leave you today. .She pulled his cheeks and get up went towards wardrobe take out his clothes and handover him towel Kunj went in washroom till Than twinkle arrange her room nicely.Kunj come out of the washroom after bath. Twinkle busy in work while Kunj take his pant and wearing just than twinkle turned. She closed her eyes. Kunjj. He chuckled and wear the pant and throw the towel on bed take shirt and went towards her. Kunj: oyee bachi open your eyes she open and look at him. Twinkle:shameless. Kunj wear the shirt while twinkle closing the buttons.Kunj playing with her hairs. Why today this much late. Kunj:aise hi meeting afternoon me hai that’s why. Kunj:hmm have to give presentation of project on each session.If anything sir didn’t like it so he can reject that time only. Kunj:pagal hai everyone is equal and talking about me me toh humesha churi ki nok pe rahata hu. Kunj:he sometimes take pa in fun but I toh can’t at all. We doing our works there.Get it now I’m hungry. Twinkle:haa come.Kunj get ready fully twinkle and Kunj both sit twinkle give him his medicine. Twinkle:haa last time I leave on you now can’t get it. Just than Kunj eyes went on something. In his hand and see its medicine some kind of twinkle get shocked. Arey twinkle what is this. Than Kunj read and look at twinkle. Bol..
Twinkle:woh it’s not mine Kunj Chinki gave me.contraceptive pills.Kunj raise his eyes. Kunj:Kya tum girls bhi giving each other’s this kind of things as well. Twinkle:acha what about you at least better than should I remind you what Rahul jiju give you at our wedding night. Kunj closed his eyes and smile sheepishly.
. Now toh.Twinkle playfully slap on his face. Twinkle:shameless creature. Have your breakfast Kunj having his breakfast. Kunj: kish ke use me hai..
Twinkle:you know everything don’t play with me. Kunj:because it’s harmful and I don’t wanted.He take the bottle in his hand from here only he throw it in dustbin. Twinkle: Kunj where is Lavanya and rubal? Kunj:rubal went back London long back while Lavanya too. Our project get end on that we all doing work.
. Twinkle cupped his jaw. Twinkle:nope you go so I can go my maternal house. Kunj:no you’ll not go anywhere yaar twinkle you stay there enough why now also. Twinkle:kunjj why I m missing my Maa and papa. Kunj:hoo what about me haa when you went there did you miss me haa. Kunj:huhu let see twinkle if you go than message I’ll not come early. Twinkle:why you go I’ll take permission of my mother in law. Kunj:than great do whatever you wanted to do.Kunj hugged her and left for office twinkle laughs out while thinking about him. Twinkle went downstairs and joint her in laws they all busy. Avantika: this one is good for Avni. Usha: haa where she is call her Priyanka. Priyanka: haa she went and call Avni both come and sit beside Avantika. Twinkle: this one is pretty..
Avni: what is this all. Lata: select outfit for yourself for you Roka.
. Avni look at twinkle and make puppy face. Avni:okay. She finding dress for herself after so much she get one. Anjali: nice now go and try..
Avni: okay she take and went in her room quickly she try and come back to everyone all get surprised to see Avni she looking so beautiful. Avantika:aww my daughter looking so beautiful man..
. Than Anjali took her lehenga in her hand. Anjali: twinkle how’s it it’s suits on you.
. Twinkle bite her finger they all select dress for theirselves. Afterwards. Twinkle: mummy ji if you don’t mind can I go Maa house I’ll be back after sometimes. Avantika: hmm okay you and come back too don’t stay if tej get to know he scold me you are elder grand daughter in law of this house you should be here. Twinkle:I know if you permit than only. Twinkle:thanks.twinkle get freshen up and left for Taneja mansion.. soon she reached and went inside everyone was sitting in living room twinkle entered there all get happy she went towards all. Twinkle: haa Maa I come missing you all. Twinkle: I don’t need of his permission my mother in law is enough. And you mahi. Bebe:you tell me how’s my damaad ji..
Twinkle:good now Bebe. He is careless have to take care of him like baby.Bichari mummy ji Bina always behind him. Leela: haan. Aur how’s everyone at home. Twinkle: fine Maa. You know what Avni alliance fixed. Malika: what when with whom? Twinkle: haa Maa she told them each and everything all get so happy. Twinkle: till now I didn’t understand what you four of them doing I mean talking like no one can’t understand in message as well.
. Nothing much just pulling each other legs mostly toh I only Rahul and Kunj or Rohan. Bebe: So their roka date is fixed haa? Twinkle:hmm everyone is busy papa ji and mummy ji is so excited for Avni really they love her so much. Malika:haa tej uncle and Avantika aunty always treat Rahul and Avni like their own kids more than.Always scold Kunj..
Twinkle:he deserve it he hardly mingle with papa ji. Malika:na uska aisa nahi. They get busy in their chit chat Leela message rt and Kabir twinkle come so rt and Kabir leave their work quickly come rt Bring twinkle favourite sweets while Coming back home. Kabir and rt went inside and meet with twinkle she get so happy and cuddles rt tightly. Twinkle:Kya papa aap bhi na.I toh missing you everyday you only find that sadu for me who didn’t let me go anywhere yeh kaam karo this and that. Rt: acha my twinkle doing all work of him. Leela: good na I was so scared how she will manage at her In law house. Tej and Manohar went for shopping they directly called their wife at mall only while Rahul and Kunj get free and sitting. Rahul: Kunj now we are free so what? Kunj: yeah. Happy for Avni Haina. Message Avni and she waiting for him at shopping centre. He read the message. Arey this girls always shopping now what? Rahul: haa okay bye. Rahul left while Kunj thinking about twinkle. Kunj:she must be went Taneja house. Hmm let’s go Kunj.He take his car key and left for sarna house. Omkara sleeping after get tired in his room Kunj reached.He went in hall. Didn’t find anyone. Kunj: Arey where is everyone just than servant come with water. Kunj: where is everyone ?? Servant: sir everyone went outside and just Rudra bhaiya Om bhaiya and Priyanka didi is here. Kunj: and where is Aayat? Servant:Aayat baby went with dadu and dadi at park. Kunj: okay send tea and snacks. He removed his coat and went towards Omkara room.And see he sleeping peacefully just than Rudra come and give Kunj backhugged. Kunj:bas.This Om sleeping at this time.
. Kunj look at him and both bothers giggled out. Let’s play with O.
Kunj: hehe due to this Omkara sleep get disturbed he wake up and look at his both brothers who laughing like anything at him. He get up. Kunj:Om you looking so beautiful look at your face Rudra bring hand mirror and show him his face he see and get shocked. But laughs out at him. Kunj and Rudra give him side hugged locked their arms around his neck. So what happened? Chote papa calls you at office? Om: As you know I didn’t go there. Om: now I understand why you here because your beautiful wifey isn’t at home na Kunj show teeth’s. Kunj: Kya Om tu bhi you are my brother and I’m your elder bother have some shame nowadays you both become shameless whatever comes in your mind telling me haa. Om:it’s our birth right haina Rudra both hifi. Kunj: she just wanted chance to go here mummy and pa easily give her permission and me never ever. Rudra: same me and pinku asked to go for panic but pa deny to send us anywhere. Kunj:great you roam enough trio lay down on bed. Rudra pulling Omkara hairs. Rudra:O cut your this zulfi please now.
. Rudra what is this haa. Rudra: why my bhaiya. Lay down at him and cuddles Kunj and Omkara fully just than Priyanka entered in room with tea and snacks she apply face pack on her face. Kunj: what is this haa. Rudra: hoo face pack roka Avni Ka hai behan meri excited hai. Priyanka: huhu. She went in washroom wash her face and come back. Kunj:good one.They trio having snacks and making face Priyanka sit beside them. Priyanka:give me too.She take and having.She looking sad. They trio read her face and understands. Kunj: what happened to you haa? Kunj: I know tell me. Priyanka: in low voice bhaiya everyone went for shopping and I’m alone. anything to wear like always I left. Om: wow. Kunj pulled her near himself. Kunj: when you have three brothers why you have any fear haa tell me where you wanted go we’ll take there you. She look at Kunj. Priyanka: but you toh didn’t like na. Om: after biwi he changed. Kunj: chup Kya biwi she is siyappa queen. Now go and get ready we’ll go for shopping. Rudra: you taking her who will take permission from pa.
Kunj: I’m na you don’t teach me go pinku. Rudra: this girls bhi na. Kunj:Kya Rudra you shop so much for yourself. Kunj:I know only me.They too get ready soon Priyanka they waiting for Priyanka. She come. Priyanka:lets go.They went outside and sit in car.Soon they reached mall. Hold Priyanka hand and went inside. Kunj: where you wanted to go. Priyanka:aww I love it this. Kunj: haa.Like this her brothers selecting dresses for her. Kunj:Chal tu bhi Kya yaad rakhega mujhe. Than they all went to men’s shop.There they doing masti and shopped lot.Kunj went to pay the bill. He come back afterwards.Now anything else Priyanka. Priyanka:nope thanks bhaiya she cuddles her brothers tightly they too her back. They went and sits in car and drove off. While going Priyanka eyes went on pani puri stall. Bhaiya please I wanted pani puri. Kunj: Chii pinku here its so unhygienic. Priyanka: no Bhaiya I eat here it’s so tasty. Kunj: okay they park the car in side and went towards stall. Priyanka: bhaiya pani puri. There many boys stand they looking at girls this seen by kuomru they covered Priyanka. She having pani puri happily making faces her brothers see this and give smile Kunj wiped Priyanka face. Have na. .After sometimes later all come back home. Twinkle: acha papa and Maa I’m going now. Rt: go na after dinner. Twinkle: no papa I have work at my house so I can’t please bhai drop me. Kabir: okay lets go.Twinkle and Kabir left for sarna house Kabir drop twinkle and left from there only. Twinkle went inside. Avantika:acha twinkle you come back good. See this things we brought for Avni and yuvi. Where is Priyanka. Rahul: even Kunj too.Just than Kunj and Omkara or Rudra along with Priyanka entered with shopping bags.All see them. Lata: Arey here they are where were you all went haa? Rudra: Arey dadi for shopping this pinku uff, they sits. Anjali:hoo alone alone without me not good huhu. Kunj:acha ji you itself went and leave her alone. Usha:aaj suraj kaha se rise hua hai I mean Kunj really. .Priyanka show them her things all like it. .Kunj went in his room.They all finished all things.Twinkle went in her room and see Kunj who laying down on bed. She went to him.Kya hua sadu. Kunj:kuch nahi he turned and look at her. Twinkle: go and get freshen up. Twinkle: hmm sure Kunj get shocked. Kunj:huhu.Siyappa queen.So everything is done. Twinkle:it’s not my time get it. After sometimes later tej call Taneja’s and Invite them too for Avni and yuvi roka at tbeir place. Neelam:what happened yuvi puttar he turned and get surprised to see her immediately hugged her. Hurt about you how can I stop. So I come to you. Cupped his face how’s you. Yuvi: nope hide it.. let’s go they went in living room Anita and Surjit or Dev sitting they joint them and maya come. Maya:biji and all come let’s have dinner. Biji: haa afterwards toh I’ll have my yuvi wife hand foods.. yuvi give fake smiled, they all went and sit for dinner maya servant them they all having their dinner. Yuvi: In mind here papa fixed my roka with sanaya there Avni she didn’t call me once now I’ll not talk to her even not think about Avni also. #At Sarna Mansion everyone sitting for dinner Aayat sitting on Kunj lap whom he bring forcefully. Kunj:what you will have she point towards noddles which siblings make for her specially.Okay Kunj take in plate and feeding her with his hands all looking at them. Kunj:Rudra Aayat you have.She happily finished her food.She feeling sleepy.She rest her head on Kunj chest and Kunj having his food. Rudra and Omkara doing noise. Keep silent she is sleeping na.Kunj lift her in his arms and went from there. Avantika:good he handling I can do my work Avni come in my room okay even you too girls. Twinkle finished all kitchen work and they all girls went to Avantika and tej room there Avantika waiting for them. They sits she and Usha tell them their all work list. Kunj patting on Aayat forehead.She sleeping peacefully.Afterwards twinkle entered in room she closed the door and see Kunj changing Aayat clothes.She went towards bed and sit and see Kunj. She smiled Kunj done with Aayat and kissed on her forehead.Covered her with blanket. Twinkle: aww so adorable Kunj.You love her lot. Kunj rest his head on palm.
. Kunj making faces at her. Kunj: very lamest you calling your husband haa. Twinkle:that time I don’t know you’ll be my husband. .Both laughs out to remember their old golden days.Kunj take her hand in his hands and kissed.Twinkle kissed on Kunj cheeks both lay down and closed their eyes.Avni was so happy she feeling giggly she thinking about yuvi. So today is Avni and yuvi roka at Luthra mansion and Sarna Mansion hustle and bustle going on. Everyone busy in their work while Kunj lifting Aayat who didn’t wanted to leave her brother. Tej:Kunj you go and check sweets. Tej:I mean go and see everything is ready or not. .Rahul sitting in room and seeing photo his parents. Kunj entered in room Aayat playing in garden he sit beside and see him. Kunj: what happened Rahul he see him and hide his tears. Kunj:I know yaar give him side hug don’t think about this all things. Rahul:time went so fast Kunj mum and daddy went and today Avni going to tie in new relationship. Kunj:toh you should be happy na I know you get emotional for your sister when I think about Priyanka even I too shakes one day she will went and leave us. But see na Avni is in family only don’t get emotional okay mummy and pa haina. Rahul:they are best thing happened in our life Kunj we lost our parents and at the same time get another parents Avni toh was very small that time she is very small. .Both laugh out.Girls pampered themselves lot and sending pics at their groups.Tej and Avantika fully busy.Girls come back from parlour looking beautiful after makeover. Usha: you all come back now go and get ready fast see the time. Kunj come back from back. Kunj:offo Meri MAA calm down. Om: Arey Maa no one can understand you ladies other side tej and Avantika in hustle all see them and laughs out truly at daughter all parents will like Kya Kya nahi kare.All went in their respective rooms to get ready. Yuvi getting ready with heavy heart just than maya and Neelam entered in room and see him both giggles to see him. Yuvi turned see who looking so hot. Neelam: hoo my boy looking so hot today.
. They all went outside and sit in car and drove off. Soon they reached Sarna Mansion yuvi get confused. Arey why we come here?? Surjit:woh I had work here let’s go. Yuvi: in mind my dad is so heartless he knows still he bring me here. 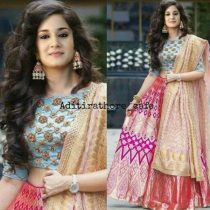 Inside each and everyone get ready whole Sarna Mansion decorated beautifully Tanejas come.Luthra’s went inside tej and Avantika standing at door entrance.They entered. Surjit:yes they greeted with each other’s while yuvi lost in his own world.They went and sits. All boys come and see yuvi. Kunj:I’ll break your teeth’s here only. Arey still my situation samj me aati hai what about him why?? Lata: Arey aap she meet with Neelam..
twinkle see and laughs out. Leela:today you all looking beautiful. Yuvi:in mind Sanaya must be waiting for me. Rohan:f**k.All girls look at him. Rahul: this will be later. Guru ji:I think tej we should call Avni. Avantika: haa twinkle and Anjali go and bring Avni. Twinkle: sure mummy ji. They both went and see Avni is fully ready she looking he’ll beautiful in her lehenga. Hoho our physiologist looking beautiful. Anjali:haa yuvi Toh Gaya Avni blushed they both take her downstairs.She coming downstairs all turned and see Avni Rahul smiled to see his sister who become so big today they went down tej and Avantika bring Avni and make her sit beside yuvi. Avni didn’t look at yuvi. While he get shocked to see her beside himself. Yuvi: what is this mom?? Maya: Abey idiot lover today is your and Avni roka..
Yuvi: what how? Me and Sanaya. Surjit: nope yuvi we just kidding with you. Rahul: yuvi you are very lucky in one day bade papa give approval yours and Avni alliance at my time. .Yuvi shocked like anything he look at Avni who giving her blushing smile.He get so happy control himself Lot. Neelam see Avni and get so happy. Guru ji:let’s started the roka rasham. Guru ji take aarti thali do their Aarti and he does tilak of yuvi and Anita took the veil and she put on Avni head all clapped for them.Anita give all gifts to Avni while tej call Rahul.He look at Sarnas brothers. They four of them went near yuvi and give him all gifts from their side and kissed on Avni forehead.They both get up and take all elders blessing. Both went near tej and Avantika. Twinkle and Kunj look at each other’s remember their time. Tej: who told this day come so soon my book worm like this I’m so happy for you Avni. She hugged tej tightly. Avni:thanks bade papa for this. Tej:koi apne papa ko thabks bolta hai Kya. .They all take sweet and feed each other’s.
. Rohan seeing Priyanka who looking fabulous.
. They all clicking photos with each other’s. Afterwards yuvi hold Avni hand take her in side. 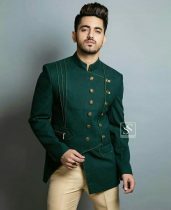 Avni: yuvi. He hugged her tightly she too him. Yuvi: avniii I’m so happy I cant believe on this he break the hug and cupped her face you looking so beautiful I’m angry with you. Yuvi: you didn’t told me here I was suffering like anything she giggles at him. Avni: awww I don’t know about this. Yuvi even I’m too happy my papa is the best.
. Both share a tight hug. Kunj pulled twinkle in side. Twinkle: Kya Kare rahe ho if anyone will see us haa. Twinkle: acha ji flirting with me. She cuddles him tightly. Rohan fully lost in Priyanka Rahul come from back and give him side hug.
. Rohan look at him. Rohan: kuch bhi what about you haa even you too Anjali that time Kya hua. Rohan:Chal Abey. It’s just normally. Yeh ladki hai Allah hai hai re Allah humming the song. Neelam: haa right. Just now roka done. Surjit: now let take leave. Rohan: Malika come at my place.
. They all bid bye to each other’s and left. Rahul come and give side hug to Avni. rahul: I’m so happy for you avni.
. Exception bhaiya and dadu all get love marriage Till now..
Rahul: true bade papa. All laughs out Kunj went from there while all get tired and went in their room. Twinkle was standing in front of mirror taking out her accessories just than Kunj went in room and see her he went near her and give twinkle backhugged she smiled Kunj side her hairs and started kissing on her neck passionately twinkle moaning his name. Twinkle:kunjj he make her turned towards him and tucked her hairs. Their face is very near. Twinkle: hoo don’t buttering. He cupped her face and give wet kisses on her face she enjoyed Lot. Than Kunj throw her duppta in side and lift her in his arms and went towards bed place twinkle on bed and come upon her she smiling Kunj captured her lips both started kissing each other’s passionately.Kunj open twinkle back dori and moving his hand on her back.After sometimes later they break the kiss and cuddles each other’s while romancing they slept. Twinkle and Kunj wake up and give smile each other’s.Both get up and get freshen up and after went downstairs everyone sit for breakfast and left for office.While this whole day passed quickly. #At evening Kunj and Rahul come back from office Kunj bring something for Aayat. Twinkle: she didn’t come back from school. Kunj:what Kunj see the time and get shocked.What are you saying her school end one hour before twinkle and you saying she didn’t come back till now. Rahul: maybe she is here only. Kunj: don’t know Kunj get up and went towards Rudra. Rudra you bring Aayat? Rudra: no bhaiya she come with driver na. Kunj:what. Maybe she come now she is angry. Both Kunj and Rudra check Aayat in whole mansion but she isn’t anywhere. Kunj try to call driver who didn’t picking up his call: why this driver didn’t pick up my call haa. Usha: Arey Kunj go and check her in school maybe she is there only. Kunj: if anything happened pa will not leave us specially you and me Rudra. Kunj didn’t wasted his time he immediately left for Aayat school soon he reached and went in school and see all kids went Kunj went to principal and asked him about Aayat. Guard: haa sir she sit in her car and went. Kunj: if you saying this than where is my sister went she didn’t come home back till now. Principal: sorry that we don’t know Kunj and Rahul get shocked. All is in tension tej and Manohar come back and see everyone they get surprised. Rudra: woh pa Aayat didn’t come back from school back. Tej: what till now. Just than Kunj and Rahul come back with sad face. Avantika: what happened Kunj?kunj look at tej he get scared. Tej: kunjj where is Aayat. Kunj: woh pa Aayat wasn’t there. Tej: what where is driver. Oops what is this Aayat?? I try to give kuomru scene..
please do share your views. The post RAB SE SONA ISHQ: TWINJ: Episode-59 appeared first on Telly Updates.